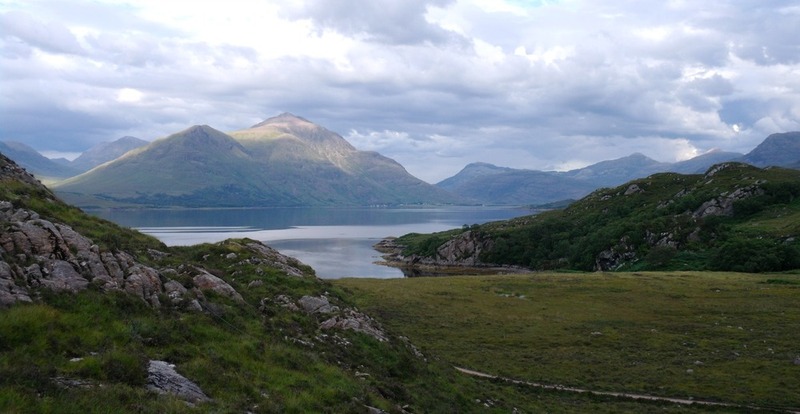 Here are some not-too-demanding walks in Highland and Lowland Scotland. Great views - worth the effort! Choosing ten great country walks is as difficult as any of the other top ten topics on this site - because there's a big choice. And there is a complication: is my idea of a country walk the same as yours? On balance, Scotland probably does wild moorland and forest walks better than say, soft, sylvan meanderings. In short, in rugged Scotland, you come to stride out, not to stroll! Alternatively, you are in Ullapool and you have travelled far enough by road for one day. You are in the midst of fine rugged Highlands and need an overview. This walk will allow you that overview, quite literally. The helpful ladies in the tourist office (properly known as a Visitor Information Centre these days) will give you a little printed-out sheet of instructions. These will take you across the main road north, then through a pleasant little housing development, and beyond that you will find the gate that starts the walk up Ullapool Hill. It's summer but the sun is playing hide and seek. Mostly hide, to be frank. The Outer Isles are hardly visible on the horizon looking west - but the ambience of the hilltop is all about rugged Scotland and the wind on the heath. Atmospheric for sure. This is really a there and back again walk and you can really stroll up as far as you feel like - but certainly high enough to see the setting of the town spaciously laid out on the flat ground on the edge of Loch Broom. By all means, follow a route all the way to the top of Ullapool Hill itself - and I recommend you do this for a sense of this classic northern upland habitat, with more than a hint of wildness: plus, of course, the sea-views westwards way to the Outer Hebrides. It’s a fine way of spending the afternoon. No matter when you visit, the town of Callander, west of Stirling, always seems busy. People stroll around the main street, eating ice cream and browsing the bargains in the outdoor clothing and souvenir stores. Day trippers from the central belt of Scotland mix with visitors from all over the world. Hmm, sounds like it’s time to escape the stir. That line of crags above the town look interesting. How do we get there? Easy. This is a circular walk, but we recommend driving uphill following the prominent (brown) sign to the Bracklinn Falls at the eastern (Stirling) end of the main street. (It’s on your right if you came from Stirling.) Park at the Bracklinn Falls carpark. Anyway, return to the carpark then turn right along the road, uphill, looking for a tight right-hand bend where there should be a sign to Callander Crags on the left side. A bit of improvising may be necessary here and you may find yourself off-piste for a minute or two, but you should be aiming for the skyline, turning gradually leftwards for the top of the craggy section. The restored Queen Victoria Jubilee Cairn on the top gives a fine panorama: Ben Vorlich and Stuc a Chroin are the big hills to the north, then clockwise, Dumyat in the Ochil Hills, the Wallace Monument and Stirling Castle are all in view. On a clear day you can see the Pentland Hills behind Edinburgh. The descent is by a path in the middle of the Crags. The path down from the far end of the line of Crags is at time of writing affected by fallen trees. Either make your way back to the Bracklinn Falls through the woods above the town, or walk the length of the main street - pausing for refreshment, perhaps - and back up to the carpark. The town’s position on the edge of the Highlands makes the views especially interesting - so, take a look at the Knock Hill, also below, listed under the ten best views. Anyway, right here, I’m recommending you drive (or cycle?) west from Crieff along the back road (Strowan Road) towards Comrie. This is a forestry track that also gives access to a communications mast of some sort, so it’s easy walking. This in turn gives you plenty of time to enjoy the ever-changing northern panorama over the Highland Boundary Fault towards the big hills. The foreground of mature trees and little farms and houses in the strath below you is altogether irresistible if you are looking for the essence of cosy, scenic Perthshire. Great in autumn in particular. Walk as far as the mast - beyond that the track is muffled by claustrophobic conifers, though it is possible to walk through to Auchingarroch and Comrie, or return to Crieff by a lower route. The starting point for this walk on the slopes of Torlum Hill on Google maps is here. St Ninian’s Cave, near Isle of Whithorn, Galloway. It’s different, it has its own character, and we look kindly upon it(!) on our Galloway page on our website. Here’s a walk I enjoyed. It goes down a wooded lane, called Physigill Glen, though it isn't very glen-like. The last time I was there I recall, on the way, picking sloes for sloe gin. The walk then goes along a pebbly shore to a cave associated with St Ninian. This shadowy figure is associated with a church he built at Whithorn - known as Candida Casa or white or shining hut or house, sometimes described as Scotland’s earliest Christian building. It was thought to be standing 150 years before the time of St Columba of Iona - the Irish princeling and missionary usually associated with early Christianity in Scotland. Anyway, St Ninian's Cave is a Historic Environment Scotland property, ie in the care of the nation. They, somewhat apologetically, say there is no hard evidence to associate the place as where this particular saint had his hermitage - but that it was likely to have been a place of retreat for the monks at Whithorn. However, there have been several religious carvings excavated from it, so it has some religious significance. Ironic, then, that it also featured in the cult movie ‘The Wicker Man’ with its pagan themes - and probably gets its visitors through that association. Pagan or otherwise, it’s a pleasant little excursion. You return by the same route. All right, the shoreline isn’t as dramatic as plenty of other places in Scotland, but this is Scotland-lite, remember? No, really, you’d enjoy the walk. I just wanted to put in something in the south of Scotland, in case you found us biased towards the north. (You noticed, eh?) So please go. It’s signed off the A747, west of Whithorn. With more time in hand you could combine it with an excursion to the south end of Loch Lomond and stroll up Duncryne Hill, which makes it into the views section, see below. The large and unmistakable stopping place for the walk is by the A809 and called The Queen’s View car park. After that it’s just a question of walking up towards Auchineden Hill, over fairly undistinguished moorland, but with great views up into the southern Highlands and Loch Lomond. The Whangie lies just beyond. So what is it? Basically, a weird wall of rock that has detached itself from a cliff, so that there is a narrow corridor between wall and cliff face. You can walk through it. That’s where the ‘whang’ or slice comes from. Isle of Bute, south end. We like the Isle of Bute. Not quite Highland, hardly Lowland, close to Glasgow and yet a ferry journey away, it’s hard to categorize. This walk down at the south end is part of the longer West Island Way. It starts where the motorable road ends, south of the last of the fine Victorian villas in the strung-out settlement of Kilchattan Bay. It’s quite a rough track, surprisingly wild in places, that basically takes in an unspoilt section of coast. It also has excellent views down the Firth of Clyde. From the wee curve of Glencallum Bay the track lifts away inland. Eventually, following posts and waymarks, you will find yourself at St Blane’s Chapel. This is another reason I included the walk on the list. Whether or not of a religious persuasion, you should find the ambience of these time-worn stones amid the trees very soothing. It’s just a gentle and contemplative spot. Looking back east across Loch Torridon, towards the western end of Glen Torridon and an end-on view of the mountain called Liathach. The midges were dreadful. The tidy houses of the planned village of Shieldaig, in Wester Ross, cluster round the curve of the bay. This walk goes past the little school at the north end of the village and follows a track, which becomes a path, into away-from-it-all rock, heather and woodland scenery, all of it with the backdrop of the grand Torridon hills to the east, as in the picture here. And don’t be surprised when you find houses - just a very few - at the very end of the little peninsula. They may give you a new insight into the idea of remoteness in Scotland. Overall, for the hill and sea views, this is a great way of spending a summer evening. Fine coffee and home baking to be found in Nanny’s Kitchen - a lovely cafe back in Shieldaig. East Lothian, the garden of Scotland and the well-to-do pleasant countryside east of the capital, mostly carries an air of cosiness and unconcern - as if the fair fields and tucked away red-roofed cottages were all saying ‘We’re quite well off, thank you, and happy to be overlooked’. All right, that’s stretching it a bit, but it all seems a bit self-consciously rural and soft! Start from the pretty village of East Linton, by the railway bridge, on Station Road. Just a short way west of the bridge a sign indicates the start of the walk, upstream, along the River Tyne. Yes, it does look as though you’re walking down someone’s drive but plough on regardless, walking upstream. Return by a very-lightly trafficked side road that parallels the river back to East Linton, but at a higher level. Then try The Linton Arms hotel/pub for a refreshing beer (at least). Altogether a very rewarding afternoon in the cosy countryside of East Lothian. Hardly Scottish at all, in fact. Traffic crosses the Border northbound at Berwick-upon-Tweed and most of whizzes on towards Edinburgh, missing out a lot of interesting coastline in consequence. Stop, stop. Turn off at Burnmouth, but don’t go down to sea level. Cross the bridge over the East Coast Main Line. By the school a wee lane runs uphill and leads on to a path that runs along the top of the cliff to Eyemouth. This section is part of the 28 mile long Berwickshire Coastal Path between the Border and Cove, near Cockburnspath. The cliff sections between Burnmouth and Eyemouth are quite wild - all the more so if you turn around and look back on the A1 and the ECML. Altogether, road and rail hubbub are a world away from the yellow gorse, the pink thrift and the soaring seabirds that you will enjoy before you drop down to the harbour at Eyemouth - good cafes, fish-and-chips and ice-cream too! Tip: We think the coffee at The Rialto is the very best! The old Caledonian Pine Forest that once covered much of the Highlands was gradually felled over the centuries so that today it is greatly reduced. The surviving stands of red-limbed trees, with their understorey of blaeberry and juniper, are atmospheric places. Some of the best examples of this habitat can be seen on Speyside where the Rothiemurchus Estate long ago diversified into all kinds of tourism offerings, as well as maintaining walks and trails through the forest. Back at Rothiemurchus, you can indulge in a big slice of cake at the Druie Cafe Restaurant! Return to the main top ten listings for Scotland Outdoors. Top Tens - Scotland Outdoors. Take sensible footwear! Beautiful beaches, rewarding country walks, big (and sometimes demanding) hill walks, brilliant views and places to see wildlife: the best of outdoor Scotland - a summary page with five categories of rewarding outdoor experiences - though with some of the views we'd let you stay in the car!